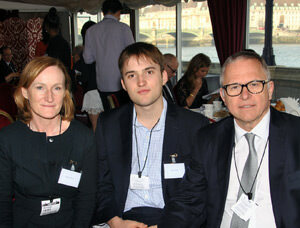 Sam Knight (pictured below left with his family) joined Collingham from Eton to complete his A levels. He achieved two A*s and an A at A level in Religious Studies, French and English. He is currently considering offers from UCL, Kings and Bristol to study French and Russian. His passions are literature and music. He has been working in Paris this year, but when in the UK he performs in a band and plays the piano. 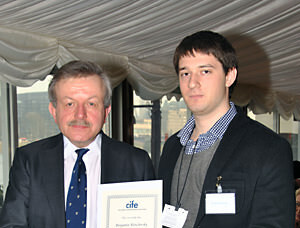 Benjamin Blinchevsky (below right receiving his award from Lord Lexden) achieved an A* in Maths and three A grades in Further Maths, Physics and Russian. He is currently at UCL reading Natural Sciences. During his last year at Collingham, he was awarded the Gerald Hattee prize for academic progress and achievement. A hard-working and dedicated student, Ben is a popular and worthy winner of the Collingham College CIFE award.